?69.99, then with the voucher code taken off is: ?64.99. Please note that the voucher code expires 22/02/2011.? 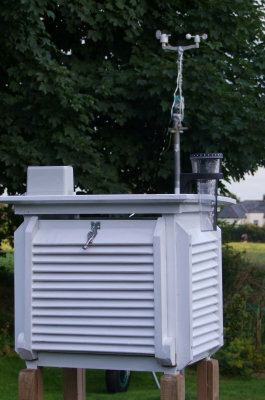 Hi there Geoff-thanks for the heads up on the weather-station offer. My Oregon Scientific model is 6+years old is showing severe signs of senility, like the rest of us ;)and the rain and wind direction indications have both gone down. One question- is the "house" display screen battery or battery and/or mains powered?. I have found in the past that the battery only versions need frequent battery change-outs. The Oregon has batteries as back up but uses a mains supply via a transformer. Just back from a few days away in Birmingham, so my apologies for the delay in responding. I keep the indoor console plugged in the the USB port on my PC 24/7 so have never had to change the batteries as the power is picked up from the computer. The two batteries in the transmitter last(outdoors) up to a year. Hi Geoff my unit arrived on Wednesday two days after ordering so please be on standby for technical back up . Very pleased so far as it sits in the box. BTW there are cable ties on offer in Lidl's this week if you wished to organise your station's cables in a less "bird nest" way!!!!. Well, Colin, I hope your getting ready for some REALLY dramatic weather to record!! Good luck setting it up - I'm always ready to help! Hi Geoffw-it looks as if the MHPA weather webpage is now up and running with Milford Docks, Pembroke Ferry, and Lawrenny Yacht Club met. data displayed. I do not know if this is the final format but IMHO much prefer the old displays. Anyway available at http://http://www.mhpa.co.uk/content.asp?article_id=1072&d=14&directory_id=14 if of interst. Thank I'll bookmark th site excellent! With my weather station we have the county covered! 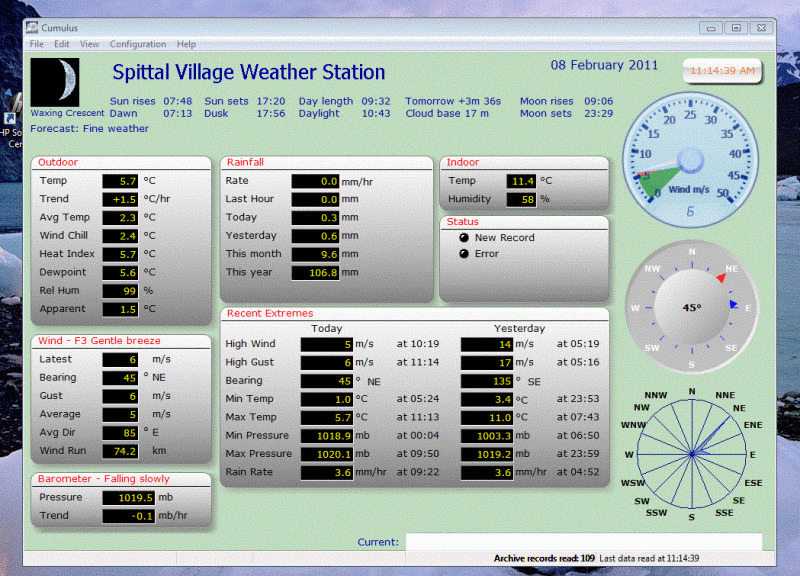 Hi Geoffw -Just touching base since I have now installed and commissioned my new weather station and have loaded software and so far things seem to be talking to each other OK and am very pleased with display(s) etc. 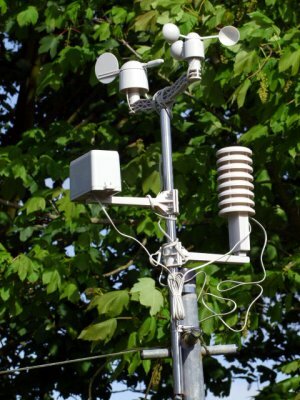 One intriguing item, which I do not know if you can help with, is that I seem to lose outside temperature, outdoor humidity, wind speed and direction and rain measurement i.e. all outdoor inputs intermittently-say twice per day.. Loss is for approx 15 minutes or so and with no intervention from me just as quickly all return!!!. There does not "appear" to be a loss from the trend memory. I fitted two Energiser Ultimate Lithium AA batteries in the outside unit thinking of longevity and reliability and am using 3 off 2700 ma rechargeable batteries in the base station. I am now connected via USB to my PC however. 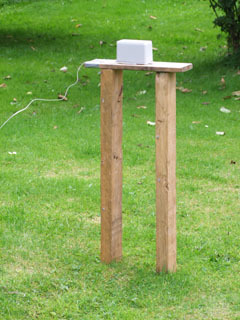 Physical distance between outdoor mast and base station approx 60ft but through a few internal and external walls. Worth me changing the batteries do you think? or any other suggestions would be gratefully received. Glad you have got it set up and running. Are you using the EasyWeather software that came with it? As for your queries about loss of contact - I think we all suffer them on occasions. There can be all sorts of sources of interference such as dodgy light switches and other wireless equipment. 60 feet should be OK, but stone of concrete walls can cause loss of signal, and make sure you do not have a fridge, cooker or washing appliance between the transmitter and receiver. If they are new batteries I don't think changing them will help as they should be fine. Let us know how it settles down.